Don't forget to pack yer reckits! Trippy. Or is that trippish? 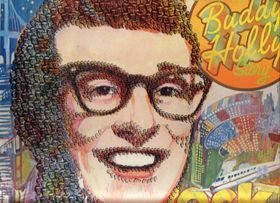 I recently picked up the Complete Buddy Holly Story, a vinyl album box set from 1973. Now all I need is a turntable. Wah, wah, wah. The great thing is that it still has the liner booklet that features producer Norman Petty's advice to Buddy Holly and the Crickets as they embark upon their first tour of the U.S. (circa 1957). Really, it's all great advice to anyone about to embark upon a trip, even today. Well, except maybe for that part about reading your Bible...ha! 1. Be at the air terminal by at least 6:30 a.m. to check your baggage. 2. Take enough cash to pay for excess weight and meals between flights ($30 to $40). 3. Take all available identification for the group. 4. Sign only engagement contracts, and nothing more. 5. Take extra guitars, strings, drum sticks, etc. 6. Take out insurance for the group. Put everyone's name on it. Make it payable to your parents. 7. Pack records with your clothes. 8. Take all available clean underwear. 9. When you arrive, take a cab directly to the hotel. 10. Get two dozen Dramamine tablets. Take one before the flight takes off. 11. Take at least 25 feet of extension cord. 12. Bring a shoe-shine kit. 13. Bring toiletry articles "of your choice." 14. Get a telephone credit card and carry it around with you. 15. Take a Bible with you. And READ it. 16. Get hotel credit cards, or at least apply for them. 17. Keep all of your receipts. 18. Send money back for deposit into your bank account.